Well today is the last day of May and therefore the last day of the Me-Made-May challenge. It has certainly been quite a challenge to try and wear something I’ve made every day, I haven’t got that many clothes! It gave me the encouragement to wear my purple jacket to WI where it was greatly admired! I did use the get-out clause of ‘accessories’ a few times, there was one day when I found myself gardening in a prizewinning beaded necklace!! I’m also doing a long distance walk at the moment over two long weekends (Grassington to Robinhoods Bay, 100 miles to the seaside!) and I prefer to walk in the proper walking clothes, but in my rucksack I did have my handmade washbag, tissue holder, hand sanitiser holder and purse, so I decided that counted! Having realised just how few clothes I have, I decided it was time to rectify this, so I started with a top. The fabric is a paisley design from B&M fabrics, I bought it a couple of months back when we had a sewing bloggers meet-up in Leeds. It was one fabric I really wasn’t sure about, it was either gorgeous or awful! It’s made up beautifully! I’m not sure what it’s made of but it drapes really nicely. I only had a metre of fabric so I was a bit limited with patterns, I decided to try a new one, Newlook 6558, the sleeveless view just fitted on my length of material. I changed a couple of things with the pattern as having read the instructions the neck and armholes were narrow hemmed, I felt I would get a neater edge with self binding. I cut 1″ strips on the bias and joined them to get the length required. I should have trimmed the edge slightly to allow for the seam allowance, but I decided I didn’t want the shoulders any narrower than what they already were. There’s a side zip which I hand-stitched in as I find it much easier than machine stitching, although I can actually get it on and off quite easily without undoing it! The fabric looked like it would fray, so I French seamed where I could and zig-zagged over the other edges. I love it! It’s really comfortable, looks good with trousers or a straight skirt, I think next time I will make it an inch longer, but otherwise it’s great, I’ve worn it twice already! 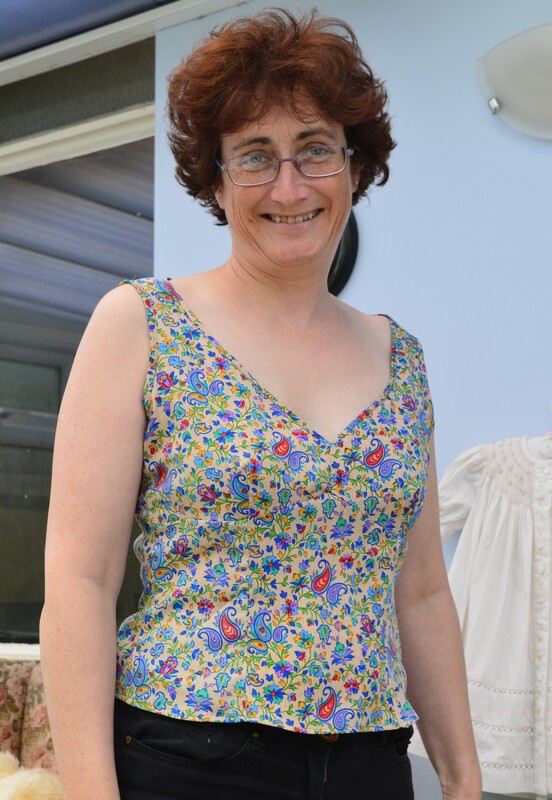 This entry was posted in Dressmaking, Serendipity and tagged Me-Made-May, Newlook 6558, sewing. Bookmark the permalink. Such a pretty fabric and a great colour on you. Thanks Lucie, I really wasn’t sure about it in the shop!